Whiteboard-style videos and Common Craft-style videos can be a great for helping students understand big concepts in short, easy-to-follow videos. But for smaller concepts, an animated GIF can do the trick. In the last few months I've come across a lot of free tools for making animated GIFs. Here's a run down of some of the better ones. Draw Island is a free online tool (tablet-friendly) for creating drawings and simple GIF animations. Draw Island offers you your choice of four canvas sizes on which you can draw. Draw Island offers two canvas sizes for creating simple GIF animations. To use Draw Island just head to the site and select a drawing tool. You can draw free hand (or should I say free mouse?) or select pre-defined shapes to use in your images. After you are done drawing, just click the save button to download your drawing or animation. Flip Anim provides possibly an easy way to draw and create an animated GIF. In the following short video I demonstrate how to create animated GIFs by using Flip Anim. Brush Ninja is a free tool for creating animated GIFs. Unlike some similar tools, Brush Ninja works equally well in the web browser on a Chromebook, Windows or Mac laptop, iPads, Android tablets, and iOS and Android phones. Watch my video that is embedded below to see the process of using Brush Ninja. The Docs365 GIFmaker Google Slides add-on will turn a series of Google Slides into an animated GIF for you. In the video that is embedded below I demonstrate how to make an animated GIF from your Google Slides. 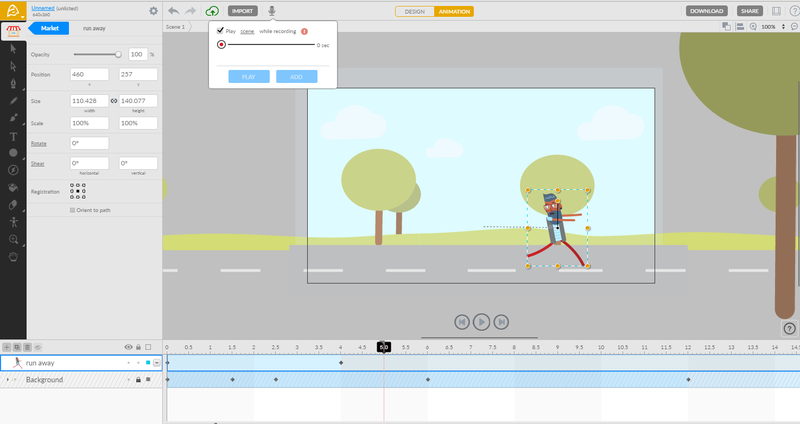 Animatron is a nice tool for creating animated videos and images. To create an animated GIF you drag and drop characters and other scene elements into frames in the Animatron editor. Scenes created in Animatron can be downloaded as videos and or as GIFs. Animatron's free plan limits you to ten seconds of download time. The free plan will let you embed and or share longer scenes via social media. The other limitation of the free plan is that you can only create five projects before you'll have to delete one.